US weather concerns continue to push US wheat prices higher – set for the largest weekly gain in some 32 months (up 11% on the week) – agricultural meteorologists are forecasting below-normal moisture levels over the next few weeks which are expected further damage the US crop. 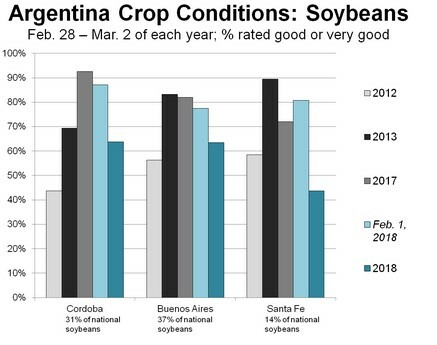 Buenos Aires Grain Exchange further reduced their forecast for Arg soybean crop on Thursday to 44 million tonnes from its previous estimate of 47 million. It maintained corn at 37 million tonnes. Ongoing drought conditions still the main market focus as strong price rally continues. There is still about a month to go before actual harvest results will begin to surface, corn harvest will commence first, with Soybeans following. Usual progress is around 20% by mid April for soybeans.